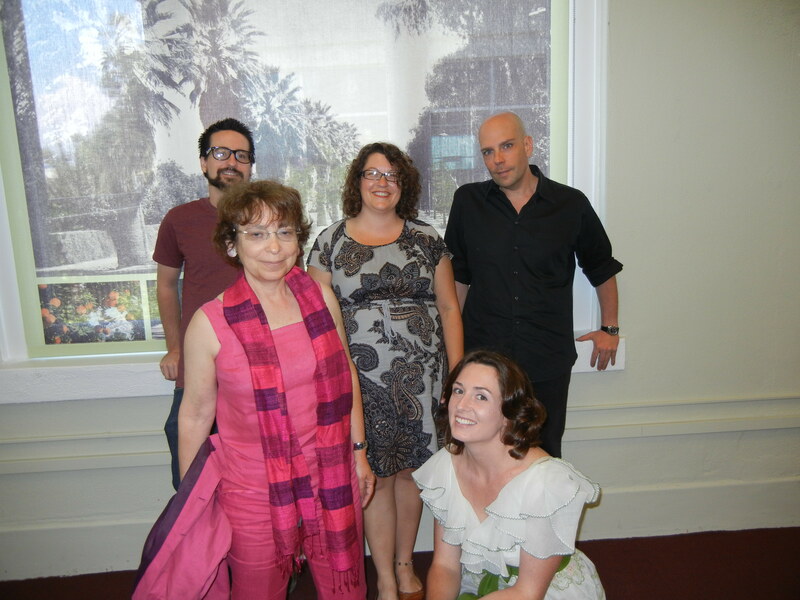 In July, P&W–sponsored poets Brendan Constantine , Nicelle Davis , Larry Eby , and Robbi Nester  kicked off LitLandia, a new reading series in California’s Inland Empire region. Project director Cati Porter reports. For a number of years now, I had been contemplating the fact that there is no regularly occurring literary reading series in Riverside, California. This is not to say that there aren’t the occasional events, including an annual Writers Week  at the local university, or other reading series in neighboring counties; just none in my city, or even the other cities in closest proximity. So, I decided to remedy that. Starting a reading series can seem a little daunting, but in my case, I already had most of the infrastructure in place. I searched the two literary journals that I founded and edit (Poemeleon  and Inlandia: A Literary Journey ) for contributors, and I drew upon my work with the regional literary nonprofit, the Inlandia Institute . At Inlandia, we have been producing quality literary programming for years, including presentations during Riverside’s monthly ArtsWalk, but the offerings are diverse, and my vision was more focused: LitLandia was designed to bring to this region a regularly scheduled quarterly reading series that includes an open mic component so that attendees (mostly writers themselves) can participate. Robbi Nester went first, reading an atmospheric poem about whale watching as well as several from a series on yoga poses that promote “emotional stability” from her aptly-titled book Balance. Larry Eby read from his manuscript-in-progress, including one titled “My Father’s Garage,” a moving villanelle titled “Pillow Talk,” and an ekphrastic piece after artwork by an instructor from the University of Redlands. Then Nicelle Davis read; I say read, but really, “audience engagement” is a more accurate description of what occured. Drawn from her collection Circe, which retells The Odyssey, Davis used puppets and props to invite readers to pluck the heart out of Odysseus the Pig, and to gouge out Circe’s eyes and pluck a booger from her nose. Brendan Constantine, the final reader, read his usual unusually smart and witty poetry, including a cento comprised of lines from letters written to him by the legendary FrancEyE . Afterward, we held a well-received open mic, with new work by talented local writers Mike Cluff, David Stone, Marsha Schuh, James Ducat, Pierce, Karen Greenbaum-Maya, Judith Terzi, and Richard Nester. As everyone was leaving, the only child in the audience presented me with a glittering gummy worm, and I held in my hand a felt unicorn attached to a rainbow, a gift plucked from the froth of Nicelle Davis’s felt board book: fitting gifts for a delightfully surreal afternoon. Photos: Top (from left): Larry Eby, Robbi Nester, Cati Porter, Nicelle Davis, and Brendan Constantine. Credit: Mike Sleboda. 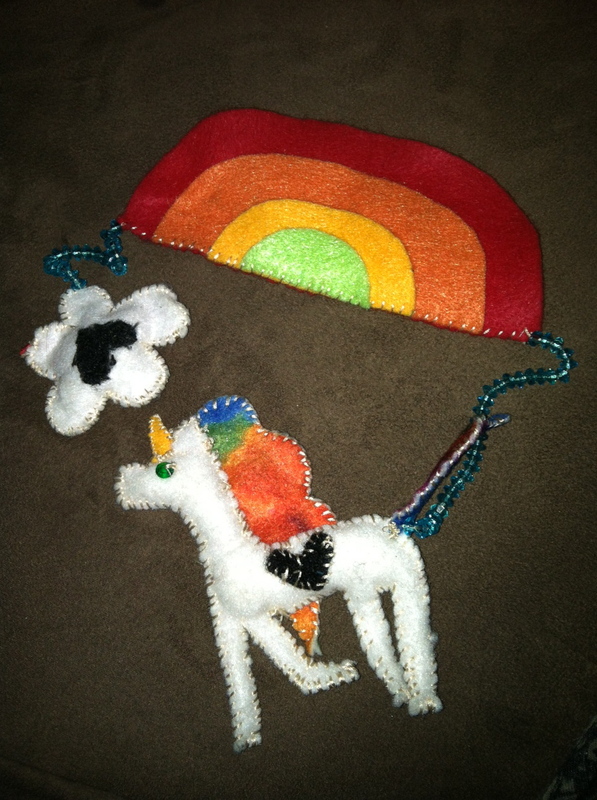 Bottom: Nicelle Davis's felt unicorn. Credit: Cati Porter.